Weather: Thursday: Partly cloudy, with a high of 81 degrees. Winds SE 4-8 mph. Friday: Mostly sunny, with a high of 82 degrees. Winds NW 5-10 mph. Saturday: Mostly cloudy, with a high of 78 degrees. Winds NE 7-12 mph. Sunday: Partly sunny, with a high of 86 degrees. Winds SW 10-20 mph. 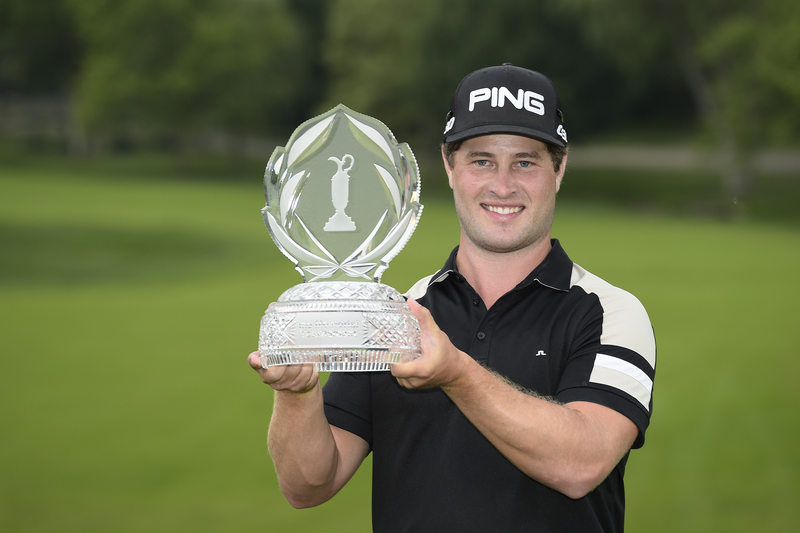 DUBLIN, Ohio – David Lingmerth kept telling himself it was his turn to win Sunday in the Memorial, even amid so many signs that suggested otherwise. He thought his 3-under 69 would be enough when Justin Rose shanked a shot from a fairway bunker, plunked a spectator in the head and had to get up-and-down from 55 yards on the final hole to force a playoff. And he did. Lingmerth was looking at a 10-foot par putt for the win on the first extra hole until Rose made a 20-footer for par that fell in from the right side of the cup, and suddenly the Swede's putt was simply to stay in the game. Lingmerth made them all until he was shaking hands with tournament host Jack Nicklaus to celebrate a victory he won't soon forget. He ended the three-hole playoff – the longest in 40 years at Muirfield Village – with a par putt from just inside 5 feet. But it was that first extra hole and his 10-foot putt to match Rose's par that showed his resolved. "I was thinking to myself that I'd probably have a putt to win the tournament right there," he said. "And then he drops it in... and this big, huge roar. Crazy feeling. So I took a few moments just to let the crowd and myself calm down because I knew how big that next putt was going to be. I've been in a few playoffs. You win some, you lose some. But I didn't feel that it was my turn to lose this time. I was telling myself that I was going to make that putt." Stoic through all the pressure, the most emotion he showed was after it was all over. His first PGA Tour victory came on the birthday of his father, Thomas, and his parents' anniversary. Lingmerth's wife used FaceTime for the father to watch the press conference, and when it ended, Nicklaus took the phone and spoke to him as Lingmerth smiled wider that he did all day. There were a few other gifts. Lingmerth is headed to the Masters for the first time, but not the U.S. Open. He has a qualifier on Monday, as if 21 holes on Sunday wasn't enough. The victory also gets him into the PGA Championship, two World Golf Championships and gives him a three-year exemption on the PGA Tour. Rose, who closed with a 72 with that superb par save on No. 18 in regulation, looked like a winner when he made the bending 20-foot par putt in the playoff. Nicklaus threw his hands up. Rose's son, 5-year-old Leo, shrieked with delight. "When I made that putt on the first extra hole, I thought, 'Wow, I'm going to steal this one.' But it wasn't to be," Rose said. He lost a three-shot lead at the start of the final round and closed with a 72. And on the third extra hole, he went from right rough to left gallery, chipped 18 feet by the hole and still had more than 4 feet for bogey when Lingmerth ended it. "He needs to look back at that putt that kept it going on the first extra hole," Rose said. "He did everything he needed to." Masters champion Jordan Spieth closed with a 65 and wound up two shots behind in a tie for third with Francesco Molinari of Italy, who was tied for the lead until hitting into the water on the 16th for a double bogey. He shot 71. Tiger Woods showed improvement – it was hard not to after a career-worst 85 on Saturday. He shot 74 and finished last, 29 shots behind, with his worst 72-hole score (302) in his PGA Tour career. "I did not win, and I wasn't even close," Woods said. "So hopefully in two weeks' time, things will be a lot better and I'll be ready to try to win a U.S. Open." Spieth was nine shots behind going into the final day and could not have imagined having to spend an extra three hours in Ohio. He chipped in twice – for birdie on the par-5 seventh and for eagle on the par-5 15th – and closed with a birdie. He posted at 13-under 275 and stuck around all afternoon to see if it would be enough. Lingmerth made sure it wasn't with a solid finish – a short birdie on the 15th to reach 15 under, and pars the rest of the way to reach 15-under 273. He did not make a bogey over the last 11 holes he played. Rose had the wild finish. A fan yelled in his swing from a tough bunker shot on the 14th, where he made bogey. He made birdie on the par-5 15th. He three-putted the 16th, only to make a 12-foot bending birdie putt on the 17th. And right when it looked like he was in trouble after the shank, he saved par with a pitch out of deep rough to 3 feet.